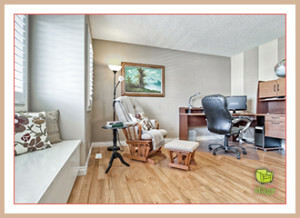 When my work as a professional home stager in Calgary is done and the real estate photos have been taken, my clients have to prepare for the next step; to be open house ready. I love keeping things simple, so this tip I found on Pinterest quickly got pinned to my board! Let’s face it. Especially when you live in the house while it’s listed for sale, having the place open house ready can be stressful. Most of us have enough going on without the added last minute stress of remembering where everything is and what we need to do to prepare so potential buyers get the best first impression of the home. Our daily lives can be busy, messy, stressful, unorganized, cluttered. Sometimes we don’t get laundry done when we planned. Stuff happens. Obviously that’s not the impression you want to leave of your property. That’s why I love the idea of an open house box. It helps you quickly get open house ready by having everything you need, organized in advance, in one handy box (with a lid). The box itself doesn’t have to be fancy. Keep it tucked in a closet and ready to go for when you need it. Any real estate documents that will be left out during the showing. By thinking this out and organizing your box in advance, you can quickly be open house ready (or ready for short-notice showings) quickly and without much added stress. Simple. 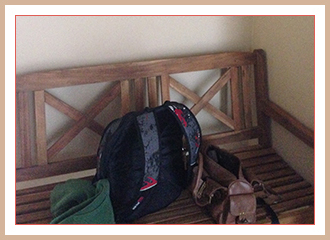 For such a small room (comparatively speaking), this one space raises a lot of questions when it’s time to sell. Here are my tips for how to stage a bathroom in a way that helps to sell your home. Think about it. 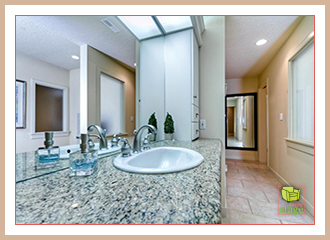 More than for its utilitarian purposes, a bathroom is one key space where you start and end your day. So when a potential buyer views your listing online or walks through for a personal showing, you want to stage for their desired experience. How does your potential buyer want to use the space? How do they want to feel in the space? Stage this room to feel welcoming for guests by adding a few special touches for comfort in a vignette with a mini vase of flowers, a few individual sized natural soaps displayed in a glass bowl, and a small piece of art that feels nurturing. Add plush white towels, a new face cloth and a nubbly rug for added softness. This room is about efficiency. Imagine how the potential buyer’s ideal getting-out-the-door-on-time in the morning and end of day bed-time routines can be presented for more ease. Highlight family-friendly features like storage, bathtubs, and counter space. This room is about retreat and re-balancing. Think spa. Ambiance. A touch of luxe in textiles and finishings. Highlights of sea tones are popular in an otherwise monotone space. 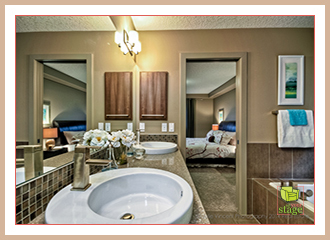 Stage a bathroom to help sell your home by keeping your potential buyer’s lifestyle needs and desires in mind. Don’t flush money down the toilet by avoiding these smaller, but important, spaces. After: Adding the blue accessories make this bathroom feel even more like a spa. For more inspiration on how to stage a bathroom to sell, check out Set Your Stage’s “Bathrooms after Home Staging” board on Pinterest. You may already have everything you need to stage your home to sell. But that doesn’t mean your home is making its best first impression. With advice from a professional stager and by implementing her DIY home staging tips, you can showcase a stunning listing that appeals to buyers for impact and results. Sometimes it takes less than you think to create a positive first impression when you’re preparing your home to sell. For example, in our DIY home staging consultation for clients in Hawkwood, one of our suggestions was a strategic shuffle in the furniture that they already had in their home. By bringing extra furniture from the upstairs area to the downstairs area, these clients opened up their living rooms, creating space to allow their selling feature fireplaces to be the focal point of each room. After all, who doesn’t want to get cozy by a warm fire during Calgary winters? Staging makes it easier for a potential buyer to imagine enjoying that experience which allows the listing to feel more like home. Guess what? After staging, this Calgary home SOLD in TWO DAYS! 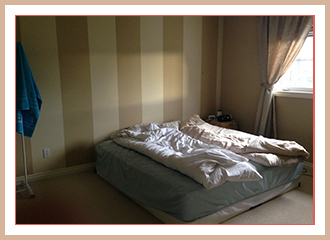 It just goes to show that, no matter what economy we may be experiencing in Calgary as we start 2016, home staging truly makes a difference! And because the service is so affordable, DIY home staging consultations are especially HOT now. How much would it take to showcase your stunning listing in Calgary? Could you use a strategic shuffle? For more examples of the power and impact staging can create in a space, take a look at the Set Your Stage Facebook albums featuring many before and after photos of the various homes and condos that we’ve successfully staged to sell. Put our ideas and experience to work for you! What’s Hot in Home Staging Services? Getting ready to sell your furnished house or condo and wondering what home staging services are most popular? In Calgary, consultations are hot. That’s because it’s hard to beat the return on investment of hiring a professional home stager to give you specific room-by-room advice so your listing stands out from the competition for a quicker sale. And of course, if you need help with the staging advice, we are here to help! 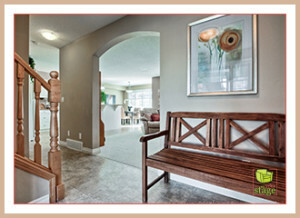 Before: Entry way before home staging. After home staging: Staging an entryway is a nice introduction to the home and sets the tone for a cozy, family friendly house. It’s surprising how much impact small changes create. Remember, when you’re preparing your home for sale, it’s not about what YOU like anymore. It’s about what YOUR potential buyers want. 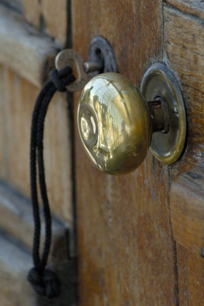 People viewing your listing for the first time may not look at every single detail with a critical eye. But humans have an uncanny ability to notice things that don’t seem “right”. These inconsistencies can create a disconnect – all of a sudden, the buyer shifts from seeing with her/his heart to becoming analytical. When that happens, their first impression changes and you’re more likely to lose them. The power of staging services is that they help potential buyers decide with their hearts. Valley Ridge: Bedding swap from red to neutral appeals to more buyers. Prominence Patterson: Simple accessories add life to a space. 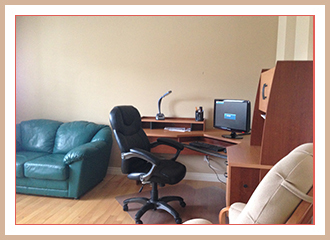 Midnapore: Swap furniture between rooms to create more flow. Tuscany: I love glass tables. But in this room, it made more sense to swap it out for a more rustic look. New Brighton: All it took was a simple bedding swap to a duvet that properly fit the bed for this room to feel more appealing. West Springs: Accessories, art, and a bench create a grounded feeling in this entry. Professional staging services don’t have to break your budget. That’s part of the reason why staging consultations are so hot in Calgary real estate. Before: Office before home staging. 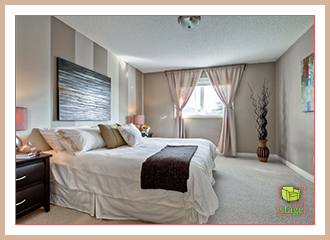 For more examples of the power and impact staging can create in a space, take a look at the Set Your Stage Facebook albums featuring many before and after photos of the various homes and condos that we’ve successfully staged to sell. You are currently browsing the Set Your Stage weblog archives for February, 2016.